An exciting film with some big action scenes and one of the last Karl May Westerns, Lex Barker stars. UFA German R0 boxset disc. Winnetou and the Half Breed was one of the last Karl May Westerns - the growing popularity of the Italian/Spanish Spaghetti Westerns, with their gritty violence and nihilistic attitudes was making the family friendly Karl May films seem increasingly dated. The script here was the only one of the Rialto studio Westerns to be entirely original and not directly based on a Karl May book, although of course the Old Shatterhand, Winnetou and Sam Hawkens characters are borrowed from the novels and the general tone is the same. CCC Film had tried a similar approach with their Old Shatterhand (1964) film, but it was critically panned. The script works well for the most part, although the beginning does not seem promising - Apanatschi's family activities are sickly sweet, and the film threatens to become a daytime kids movie - fortunately it picks up once Shatterhand arrives at the 25 minute mark and builds to a strong, and tense climax. Generally the storyline is remniscent of Karl May's Treasure of Silver Lake (1962), with the promise of gold being enough to motivate cold-blooded murder, while Shatterhand and Winnetou have to rescue a girl from the bandits, with help from her beau. In light of the newly popular Spaghetti Westerns, the film itself is very different in tone to the earlier Karl May Westerns - gone are the dramatic adventure sequences and epic feel that formed the backbone of Winnetou 1 - 3 (1963/5), instead replaced by a more "town centred" storyline and grittier action. 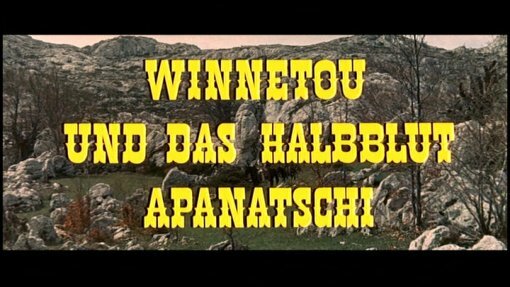 As a result, Winnetou and the Half Breed often feels rather torn between the family friendly tone of the scenes involving the children, and the violent action scenes. Director Harald Philipp does a good job shooting the action, but the film suffers from some noticably bad editing - scenes often seem to cut away too early, and a lot of key action seems to take place off scene - characters will often randomly appear together with no mention of when they met - and some scenes seem to be unfinished. Production is strong and the practical effects look great, although an optical effect at the start looks very poor. The music is decent, similar to that used in the rest of the films, although its implementation is rather bitty in places. Lex Barker and Pierre Brice give typically good performances as Shatterhand and Winnetou again, and they are joined by regular Ralf Wolter as Sam Hawkens. Götz George makes his third appearance in the series, this time as Apanatschi's fianceé, and looks good in some solid action sequences. The rest of the cast, including the attractive young Uschi Glas as Apanatschi herself, look good in their roles. Although the Karl May Westerns were on their way out, and Winnetou and the Half Breed lacks the epic adventurous tone of the early productions, it is still an enjoyable film, with some very good action scenes, if it is a little confused about its tone. Recommended to fans of the series, althougn Winnetou 1 - teil. (1963) and Treasure of Silver Lake (1962) will make better starting places for newcomers. Anyone famous in it? Lex Barker - an American actor who made his name in Europe in adventure and horror pictures. Any violence? A few gun, fist and knife fights, some blood. Good soundtrack? A suitable orchestral soundtrack. Fans of the series will enjoy this, and it should be interesting to Spaghetti Western fans. Visuals Original Aspect Ratio - 2.35:1 anamorphic wide-screen. Colour. The image is very good - some noticable grain but great colours and detail. Audio German 5.1 and mono. Strong audio. The remix is rather poor - with some noticable digital echo. English mono. Sounds good, some hiss. A few shot dialogue scenes are in German only. English - this track translates the English soundtrack, so there are some discrepancies when watching the German as the translations are different. Impressively it even recreates the rhyming language used by one of the characters. English subtitles are also provided for the German scenes on the English audio track and are "forced". Packing Only available in the Karl May Collection 1 boxset. Other regions? Other German releases from Kinowelt - no English options. Cuts? The film is believed to be fully uncut and includes the scenes cut out of the English language prints. The film was cut by 9 minutes on inital release for an FSK 6 rating, most of these scenes seem to have been restored. Titles and credits are in German. An interesting later Karl May Western, closer in tone to the Spaghetti Westerns, but retaining the feel and themes of the original novels. Recommended to fans. A good looking release of this film with a decent English audio track. Find the other films in the Karl May Collection 1 boxset. Find our other Karl May Western DVD Reviews. All text in this review written by Timothy Young -19th November. 2006.